I noticed tis gorgeous Patek Philippe magazine ad in the November 2016 Architectural Digest. The ladies Annual Calendar with a moonphase is beautiful!!! As I understand it, Patek Philippe Thierry Stern's wife designed this magnificent ladies watch!!! It's kind of bizarre to note this ad does not have Patek Philippe's web address on it, which makes it look very old school. Kamille is a reader of Jake's Patek Philippe World and he wrote in today to ask what the "blue beauty" was the upper right hand corner of the banner on Jake's Patek Philippe World, so I thought I would share this. 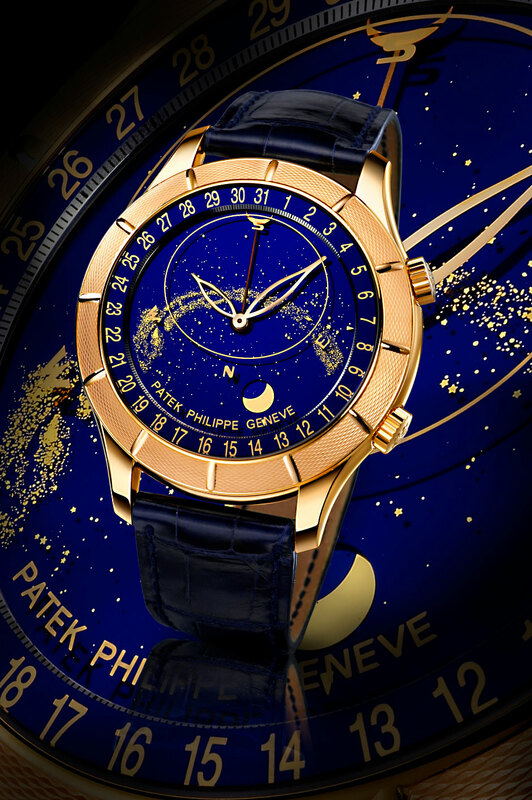 In 2009, Patek Philippe made this one-of-a-kind Reference 5106, which is based upon the celestial Reference 5102. This unique rose gold watch features a special hand-tooled guilloché etching on its 22kt gold bezel. 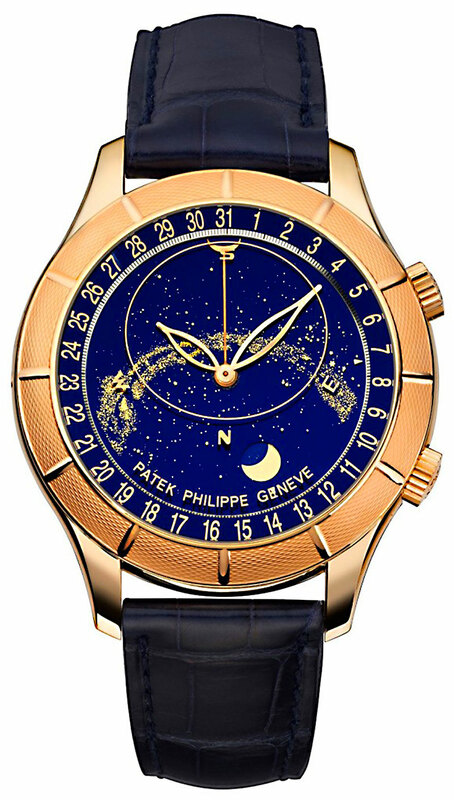 This unique Patek Philippe shows the night sky of the northern hemisphere as it rotates backwards (counter-clockwise). This illustrates the angular progression of the stars as they appear, relative to Sirius (Meridian Passage). The User Interface also displays the angular position of the moon as well as its phases and meridian passage. All of this apparent magic is achieved by a number of sapphire crystal discs that are stacked on top of each other and move at different speeds. The blue sapphire crystal that shows the cobalt blue background has 279 teeth and it shows the moon orbit, including the orbit of the moon, in a round aperture. There is another transparent disc with 356 teeth that shows the Milky Way Galaxy. The Patek Philippe Reference 5106 has an exhibition case-back which allows viewing of the 325 part movement. The photo below seems to show the exact same watch, but I noticed the photo on the top has a red date arm, as apposed to the one below having a gold one. This one of kind Patek Philippe was auctioned on September 24th, 2011 for 535,000 Euros (around $750,000) by Patrizzi & Co during the Monaco Yacht Show, which was attended by HSH Prince Albert II. All the proceeds of the sale went to support research into Duchenne Muscular Dystrophy.